Introduction: Obturator hernias (OH) are rare and difficult to diagnose. While they account for as few as 0.073% of all hernias, their mortality can be as high as 70%. OH affects women more commonly than men (ratio ~8:1). Other risk factors are emaciation, multiparity, and chronic conditions that increase the intra-abdominal pressure such as COPD and constipation. Typically more frequent on the right side, obturator herniae carry a bilaterality incidence of 6%. The typical clinical presentation for OH is one of partial or complete small bowel obstruction. Computed tomography (CT) is the diagnostic tool of choice. Although obturator hernias have been treated with a variety of surgical techniques, few report using a laparoscopic approach. Methods: We describe a case of a 90 year-old female who presented with signs of small bowel obstruction and a CT scan demonstrating an incarcerated left obturator hernia. We performed an exploratory laparoscopy to assess bowel viability followed by a totally extraperitoneal (TEP) herniae repair with mesh. Results: After initial fluid resuscitation, the patient was taken to the operative room. Initial exploratory laparoscopy identified spontaneously reduced small bowel that was dilated, but viable. Obturator herniae were evident with puckering of peritoneum bilaterally. A pre-peritoneal space was generated and two 5 mm ports were placed in the midline. Further dissection revealed bilateral obturator, left femoral, and right indirect inguinal herniae. Two separate Prolene mesh (6 x 4 inches) were fashioned and inserted to cover all defects in a standard totally extraperitoneal repair (TEP). The patient recovered well from the procedure and met criteria for dismissal in the postoperative day 2. She remains well in follow-up. Conclusion: A 90 year old female with a small bowel obstruction related to an incarcerated obturator hernia was treated effectively with a laparoscopic approach. 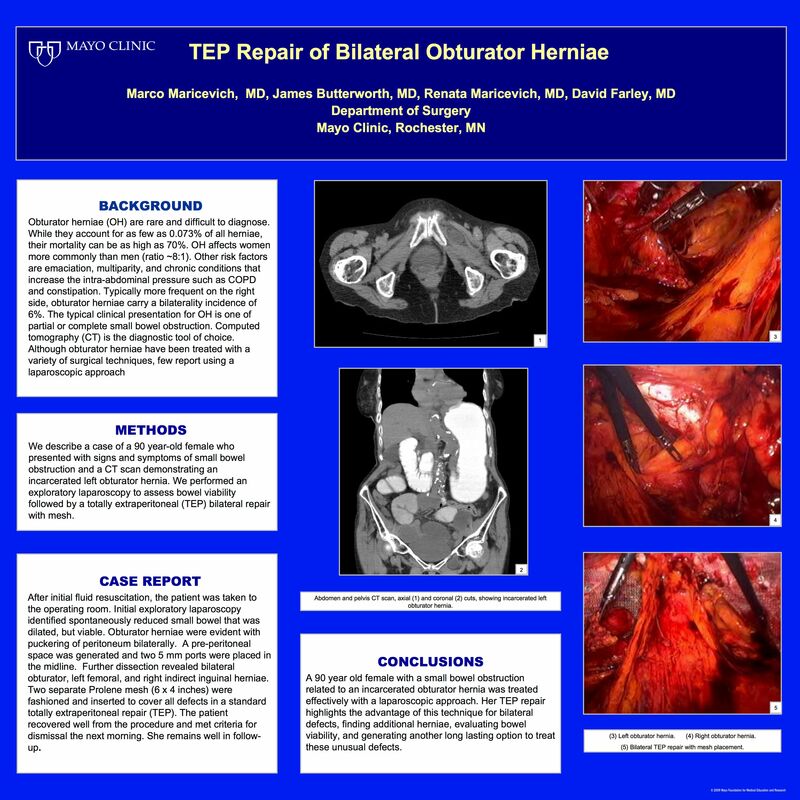 Her TEP repair highlights the advantage of this technique for bilateral defects, finding additional herniae, evaluating bowel viability, and generating another long lasting option to treat these unusual defects.